We’re continuing a short series on “Coins of the Bible” and what they tell us about the stories that contain them. In Luke 15:8-10 Jesus tells a parable of the “Lost Coin.” This was the second of three stories about how heaven rejoices over the saving of the lost, contrasting it with the attitudes of the Pharisees. There is more to this lost coin story than simply the usual observations of: First, the lost sheep know they are lost, but don’t know how to return home…the lost coin doesn’t know that it’s lost…and the lost son both knows he’s lost and how to go home. These represent the three basic conditions of the lost. Second, the coin bears the image of its maker, reminding us of the divine image, though somewhat obscured, still present in the lost soul. What is sometimes lost is more about the audience this parable was for: it was specifically for women. The clue is in the word Jesus uses to describe the coin. He calls the coin one of ten “drachmas.” This is an archaic term, even in Jesus’ day. Imperial Roman coins were current, including the same-sized silver coin denarius. Why wasn’t denarius used then in the parable? Because these ten drachmas predated the Romans. They were part of the woman’s bridal dowry. More likely, it was part of her mother’s and even grandmother’s dowry. The imagined loss of a drachma would have caused the ladies present to gasp at Jesus’ story. Men wouldn’t have gotten the sense of loss. To them simply replace the loss with another coin. But the sentimental value was much higher than that. Jesus was saying that heaven sees the sentimental value of the original children of God outweighing any potential copies or replacements. God wants the originals. The woman asked her lady friends to rejoice with her after her efforts were successful in finding her coin…the men wouldn’t get it! Pictured is a possible candidate of the coin in the parable. 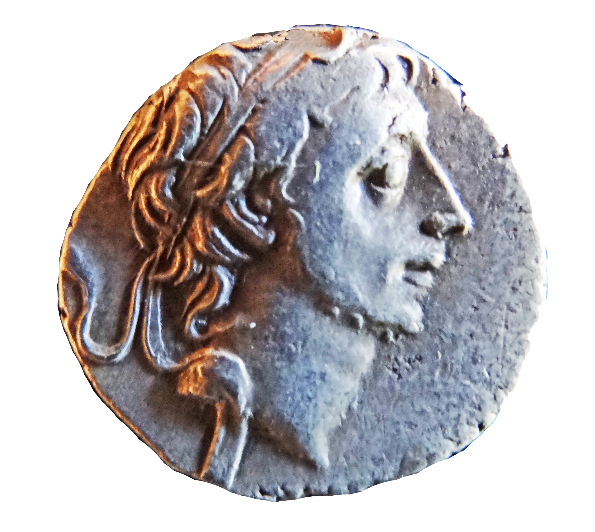 It is a late Seleucid drachma circa 44 BC. It is the size of an American dime.